Donate today to make a difference in a child’s life! Your donation to our annual campaign is the foundation on which we accomplish our mission of building strong kids, families and communities. With your support, we can provide assistance to youth, adults and families so that they can participate in our programs. Your gift will ensure a brighter future for our community. 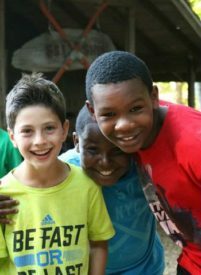 Our goal is to bring 336 kids to camp this summer who otherwise wouldn’t have the life-changing Camp Jewell YMCA experience. However we need your help to make this possible! As a non-profit 501 (c) (3) charitable organization, Camp Jewell YMCA is grateful for the generosity of its donors. Please consider helping us by making a donation to the YMCA’s Annual Campaign today. Discover other ways to help camp. Many employers participate in a matching gift program in which they match the gifts their employees make to charitable organizations. They may even match gifts made by employee’s spouses, retired employees, and company directors. These programs provide the opportunity for your employer to double or even triple your gift to the YMCA. There are many ways that you can support the work of the YMCA of Greater Hartford and all its branches and programs. Charitable donations are the foundation of the great work of the YMCA. Hundreds of past planned gifts to its Endowment Fund continue to benefit the Y today. People who make a planned gift to the YMCA become a part of The Heritage Club. Gifts from this special group of people provide the YMCA will an important stream of income, providing a source of stability for the future. A planned gift is a gift of any kind for any amount and for any purpose — operations, capital expansion, or endowment — whether given currently or as part of an estate plan. A charitable bequest through your will offers a flexible, thoughtful way to remember the YMCA. After providing for family and loved ones, consider a bequest to support a YMCA program or branch special to you. A bequest may be done in several ways. Charitable bequests provide an opportunity to support the YMCA and its mission forever and the financial security of knowing your assets remain available during your lifetime. Life insurance policies provide a simple method of making a significant gift to the YMCA. If you have a paid life insurance policy that you may no longer need, donating the policy to the YMCA can both support the Y and fulfill charitable objectives and receive tax advantages. Or, you may consider purchase of a new policy and make the YMCA the owner/beneficiary of the policy. Makes a gift using an asset your family no longer needs. Allows a leadership gift to the YMCA without affecting gifts to family members or other beneficiaries of the estate. Simply contact your life insurance company and request a Change of Beneficiary/Ownership Form. Designate the YMCA of Metropolitan Hartford, Inc. as the new owner and beneficiary of your policy. For an outright gift of a fully paid up policy, you will receive an immediate income tax deduction for the current value of the policy. For a gift which will be paid for by future premiums, you make donations to the YMCA of Metropolitan Hartford, Inc. so we have funds to pay the insurance premiums. Put another way, the donor covers the premium payments that the charity now makes on the gifted policy by making regular additional monetary gifts to the charity. If you retain ownership of the policy, benefits payable to us at death can save you federal and state estate taxes depending on the size of your estate and your state of domicile. The information contained in this document is general tax information and should not be considered as a substitute for advice from an attorney or financial professional. The YMCA encourages you to consult with your adviser to determine the specific impact to you and your family. The YMCA of Greater Hartford accepts gifts of appreciated securities as payment of any form of a charitable gift. These gifts may be beneficial to income tax savings and capital gains tax. You can donate stock, stock options, and other investments to Camp Jewell YMCA. For more information please email camp.